Getting links is often one of the primary goals of content marketing. Marketers and brands create compelling content with the hope that publishers will notice, feature a story about the content, and link back to the original creator. However, all links are not created equal. Different types of links have varying values, just as links from high-authority sites have more value than links from other sites. As a leading content marketing agency, we classify each link so we can give it an accurate value and see how it supports a diverse link portfolio. Let’s look at the types of links that exist and how they impact a content marketing campaign. A successful content marketing campaign will generate all of the link types mentioned in this post. There will be a variety of links, and they will appear on sites with a wide range of domain authority. A dofollow link is a direct link from one site to another that is recognized by Google. With a dofollow link, the linker passes some of their equity/authority through the link. A dofollow link is the most valuable type of link as it passes SEO value and authority to the site it leads to. 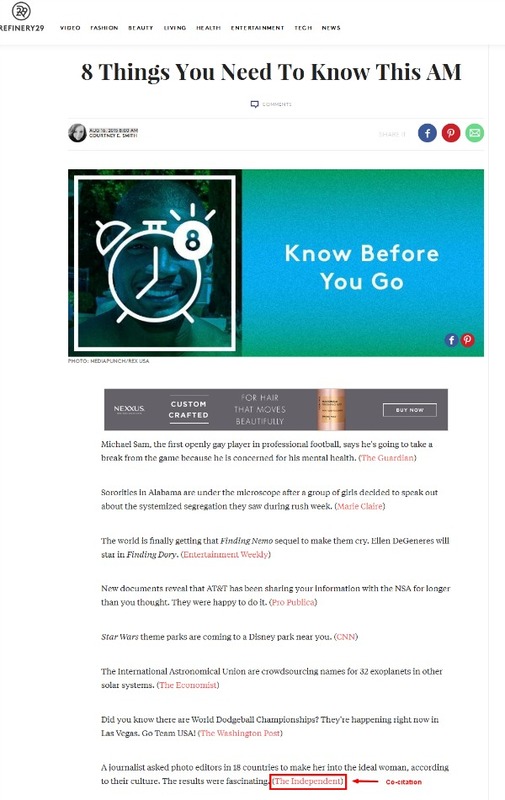 Dofollow links are active hyperlinks with anchor text (the text that is hyperlinked) that is typically related to the name or topic of the campaign’s content or publisher. In the screenshot below, you can see how our Perceptions of Perfection campaign is referenced and linked to in an article on The Huffington Post. A successful content marketing campaign naturally builds these high-quality dofollow links. The content is extremely compelling or useful, so other websites link back to it. This is the type of natural linking that search engines like to see. 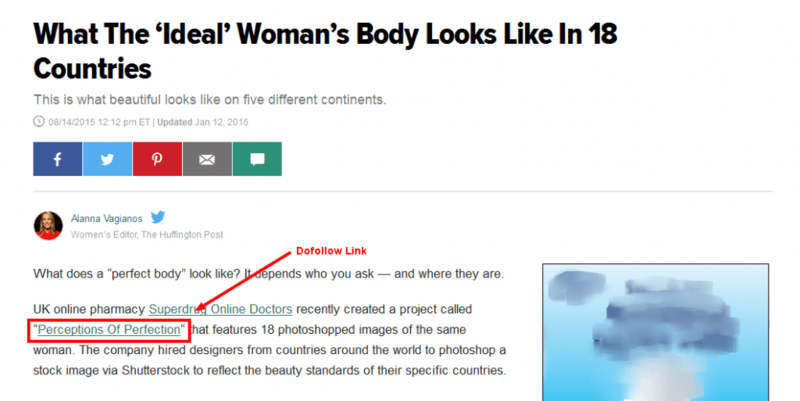 Our Perceptions of Perfection campaign (which showed the body image of one woman Photoshopped by graphic designers in 18 countries) is an example of how creating interesting content related to a hot topic can naturally catch the attention of publishers and organically build dofollow links. The landing page for the campaign on the client site received over 480 dofollow links. Links came from sites with high domain authority like BuzzFeed, Mashable, Yahoo, and The New York Times as well as lesser-known websites with lower domain authority. Domain authority, aka DA, is a metric from Moz that is the “best prediction for how a website will perform in search engine rankings.” This metric helps us place a unique value on each dofollow link. The higher the DA of the website with the link, the higher the value of getting a link on their site. At Fractl, we place greater importance on high-authority links, but we also see the benefit in getting dofollow links from both high- and low-authority websites. A diverse link portfolio with numerous types of links of varying quality is a sign that links were acquired in a legitimate way. Now, let’s go over the other type of direct link: the nofollow. A nofollow link is also a direct link from one site to another, but it has a special “nofollow” condition in the source code that prevents Google from recognizing a shift in equity or authority from one site to another. A nofollow link is similar to a dofollow link in its appearance. But unlike a dofollow link, a nofollow link blocks the SEO value from being passed to the site its linking to. In the screenshot below of an article on Daily Mail, you can see how the dofollow link looks the same as a nofollow link. Because of the highlighted code above, the link does not pass authority from one site to another. Even though it may seem counterintuitive, nofollow links can be incredibly useful. If you get one from a top-tier site with widespread natural syndication, there are still big benefits. For one thing, nofollow links are just as valuable for driving traffic back to your site as a dofollow link. But traffic isn’t the only benefit of a nofollow link. You can actually get more dofollow links due to a nofollow link. For example, Daily Mail generally only gives out nofollow links for its published stories, but because so many writers and websites from all over the world syndicate content from Daily Mail, an article from this source may end up receiving countless dofollow links as a result of that original nofollow link. The “Perceptions of Perfection” campaign received 34 nofollow links, including the one on Daily Mail. And that link may have been the catalyst for the report receiving many of its 480-plus dofollow links and driving traffic back to the website – indicating that nofollow links do have value. There are a variety of tools that offer easy ways to identify nofollow links. The best options are toolbar plug-ins like the Moz SEO Toolbar that highlights nofollow links directly on the webpage. Or you can use a tool like Varvy that reads a webpage and delivers a report on the page’s links. Now let’s move on to the next link type: the co-citation. A co-citation occurs when a site links to a story about your campaign but does not link back to your site. Instead, a co-citation links back to a third-party article that references your original content. For example, an article on Refinery29 referenced the Perceptions of Perfection campaign in an article. But instead of linking back to the original report, Refinery29 linked back to The Independent’s story about the campaign. It’s fair to assume that some value is passed when the structure is co-citation > direct citation > your site; however, a co-citation link is not as valuable as a dofollow link. You can reach out to the publishers who have given co-citations in an attempt to convert them to dofollow links through a process we call link reconciliation, where we ask the writers or editors of these articles to give proper attribution. Do publishers ever cover our studies or reports without linking at all? They sure do. Often known as a “brand mention,” text attribution occurs when a publisher gives a brand credit for a campaign, but it doesn’t give a link back to the site. In the example below, you can see how The Huffington Post Canada covered the Perceptions of Perfection campaign, referred to the website, but failed to link to either. There has been speculation that these text attributions, also called implied links, are valuable and recognized in some capacity by Google. But since they are not as valuable as a dofollow link, we attempt to convert these into dofollow links through link reclamation. This helps us secure as much authority and value as possible. Those links appeared on sites with a DA ranging from 1 to 100, with 100 being the highest possible authority. The diverse results created a natural link portfolio that told search engines the content was spread naturally and organically, giving it higher authority online and making it a more successful campaign. Also, by categorizing each link and looking at the results this way, we were able to get a complete picture of the campaign’s impact. Instead of seeing the results as 580 equal links, we were able to see the unique value of each link and get a good look at the diversity of the link portfolio. With this information, we could better assess the ROI of the campaign, shape the direction of our future campaigns, and continue to improve our outreach efforts. There are plenty of benefits of content marketing that go beyond links, and our campaigns do more than simply build a large and diverse link portfolio for our client. Check out more of our content marketing case studies to read about how we create link building campaigns for our clients.